Daniel Lee's streak of dramas, Till Death Do Us Part, A Fighter's Blues and in between those, Moonlight Express, cemented a reputation of a director that actually could combine his overblown MTV style with felt, subtle drama, this film being no exception. But it's either that the marketplace has no place for a Lee of this sort as evident by his subsequent action output (1*) that shows a director with a style destroying action films. Maybe Daniel has become disinterested or discouraged for whatever reason but with this review of his 1999 effort, I want to express my sincerest admiration for his work, even though this production does suffer from imperfections. The extensive writing team latches onto plot ideas from City On Fire, heroic bloodshed films in general but also draws inspirations from the emotions generated by various good dramas out there (2*) and it's when focus is turned away from any kind of violence or tension that Moonlight Express celebrates triumphs. The drama concerns the age old hanging onto a past in the present, with the contrived notion of a doppelganger identical to a lost loved one but the writers (3*) focuses strongly to not bring stock emotions and content. In fact, Moonlight Express strikes an almost pitch perfect balance of complex enough emotional storytelling without obscuring anything. Lee plunges Takako Tokiwa's Hitomi right in the middle of emotional turmoil early. All is going unbelievably great, disaster strikes, all contained within a very busy handheld frame that is mostly welcome. Even quicker we have her and Leslie Cheung in frame again but here's where Lee does the smart thing by using the plot of two foreigners to stall any outbursts or developments. Leslie Cheung's Karbo doesn't know instantly why he's an object of desire for Hitomi because she has trouble herself expressing this, not just through a limited vocabulary of Cantonese. Then slowly and surely, Lee begins the journey of Hitomi. Proceedings between the two turn goofy at times and the uncertainty/absurdity of the whole situation delays any kind of emotional response until a powerful moment where she can't hold back anymore. As sappy as it sounds, as she goes through the things she wanted to experience with her future husband, it really turns out to be beautiful and touching in an actual way. Predictability threatens to rear its head and to an extent it does when it's revealed Karbo is clinging as much onto a past tragedy as Hitomi but Lee here not only has stabilized the camera, he's creating familiar excellence of the highest order. The performance by newcomer to Hong Kong cinema, Takako Tokiwa helps immensely. She appeared in several Japanese TV dramas with success and skillfully grabs the opportunity to break out in feature film with this co-production. There is an awkwardness to Takako's presence and delivery but it serves the character extremely well as she's also using exterior to hide emotional inner turmoil while struggling to communicate. She's equally adept at dishing out the subtle behavioral nature to the journey, giving off both extended moments of sweetness and confidence in front and surely behind the scenes. And if anyone has a beef with her Cantonese delivery, you're not following the story. It's also important that she bounces well off her co-star and vice versa. Check. Leslie Cheung's boyish looks may look inappropriate for the role of an undercover cop but Cheung was such an immersing actor anyway that this versatility wasn't a stretch. Karbo hides in a tough shell for the sake of his character within a character but there genuinely exists a man of emotions in there, which is something no one can or could ever deny Leslie wasn't capable of performing. The demons within him gets gradually revealed and while it doesn't share the primary highlight of Takako Tokiwa's arc, Cheung comes through in spades. In a brief supporting role, Michelle Yeoh flexes her dramatic acting in a very calm and telling way. Moonlight Express is great, big proof of Daniel Lee's excellent chops as a director of character drama though and someone should tell him that more frequently. If he wants, he can combine this filmmaking and then give us dreck like Star Runner but I again want to evoke an aura of encouragement towards the director to push for the style he knows he does best. And when that's the case, he utilizes the different mediums (video, stills and the otherwise dreaded MTV cam) better than most filmmakers in Hong Kong ever could, in a commercial way even. Issued as part of Mei Ah's remastered dvd line, the film doesn't look like an upgrade despite the anamorphic transfer (framed at 1.76:1 approximately). Print is murky, occasionally grainy and colours subdued but it isn't distracting as such because part of it lies in the design by the cinematographers Keung Kwok-Man and Chan Chi-Ying. I doubt it's much improvement over the old disc though. The Cantonese Dolby Digital 5.1 option (the track mixes Cantonese, Japanese and English) isn't the clearest sounding in the world and barely uses the front channels to any good effect. Foley work, although I don't believe this is a remix, is rather sloppy also, primarily evident in the action scenes. A Mandarin Dolby 5.1 track is also included and as far as I could hear, it only dubs the Cantonese dialogue of the film. The English subtitles has some awful grammar at a select few times (some intentional since it's coming from the Hitomi character) but presents a translation otherwise that is very bearable. You can also choose Korean, Malaysian, Vietnamese, Indonesian, Thai, traditional Chinese and simplified Chinese subtitles. Mei Ah takes us on a slight journey through extras territory, starting off shaky with the often useless Databank (containing the also often useless cast & crew listing and the plot synopsis). Things get a little bit better when we get to the making-of (7 minutes, 36 seconds). Optional subtitles in English and traditional Chinese are thankfully available (along with Cantonese and Mandarin language options). Little is revealed by the cast & crew as the program mainly is a scattershot video diary of the shooting with the best moments conveyed through Tokako Tokiwa's Japanese narration. A music video, (consisting of movie footage only) for the Henry Lai composed number with the English title "Looking For A Night Of Happiness" by Tienji Tang, finishes the disc. Advertised as a 2 disc set, the second one actually holds the Official Soundtrack of Moonlight Express, presenting both Henry Lai's score and chosen music (including Richard Yung's "Flame In My Heart" and the title track "Moonlight Express" by AD, saved till last). A varied selection of moody character themes, upbeat ditties and even death metal certainly makes it varied but the mentioned tunes along with Lai's instrumental cues are more memorable than anything. There's also a postcard in each of the amarays. (1) Latest being the largely slammed Star Runner and Dragon Squad. (2) Derek Yee's latter Lost In Time today serves as a minor comparison piece. (3) One is Law Chi-Leung who directed Leslie Cheung's last movie Inner Senses. 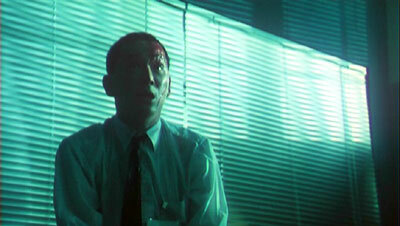 (4) In Lee's case for this film, it means green colour schemes and a camera dancing about all over the place.